The Files step of the wizard is available if you have chosen to create a file-level backup. At this step of the wizard, you must specify the backup scope — define what directories with files you want to include in the backup. In the file-level backup mode, you must include in the backup at least one directory. If you do not want to back up some subdirectories of the specified directory, you can exclude these directories from the backup. You can also include or exclude files of a specific type in/from the backup. You can specify file names explicitly or use UNIX wildcard characters to define file name masks. 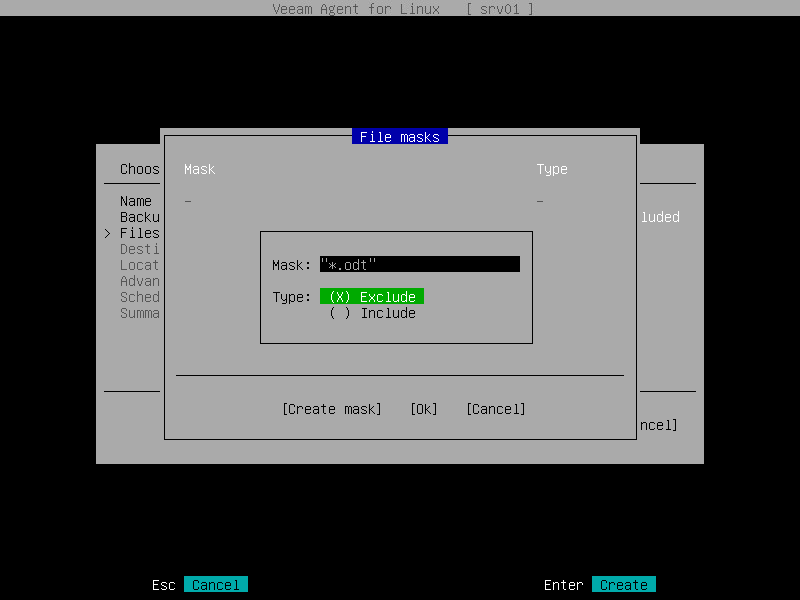 Veeam Agent for Linux will apply the specified file name masks to files in directories that are included in the backup. At the Files step of the wizard, make sure that the Add directories option is selected and press Enter. In the Choose directories window, select one or several directories that you want to include in the file-level backup. To navigate the list of directories, use the Up and Down keys. To browse for subdirectories, navigate to the necessary directory and press Enter. To include a directory in the backup, navigate to the necessary directory and press Space. The included directory will be marked with the '+' character. All subdirectories of the selected directory will be included in the backup too. Browse for subdirectories of a directory that you have included in the backup. Navigate to the directory that you want to exclude from the backup and press Space. The excluded directory will not be marked with the '+' character. Switch to the OK button and press Enter. 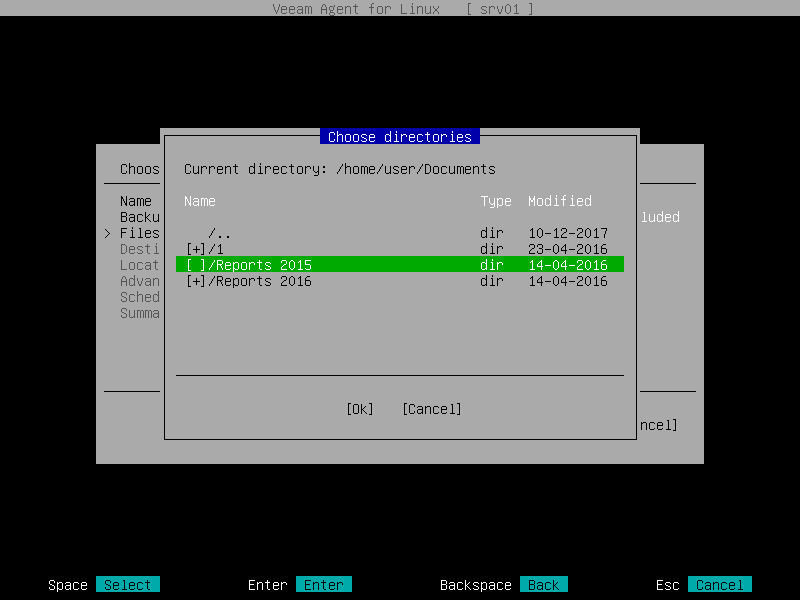 Veeam Agent for Linux will display a list of paths to the selected directories and the number of excluded subdirectories for each directory in the list. Select the File Masks option with the Tab key and press Enter. In the File masks window, make sure that the Create Mask button is selected and press Enter. In the Mask field, enter the file name mask, for example, report.pdf, *filename* or *.odt. Exclude — if you do not want to back up files whose names match the specified mask. Veeam Agent for Linux will back up all files in the directories selected for backup except for such files. Include — if you want to back up files whose names match the specified mask. Veeam Agent for Linux will create a backup only for such files in the directories selected for backup. Veeam Agent for Linux will include in the backup all files whose name begins with report except for the files of the ODT format. Press Enter. Veeam Agent for Linux will display in the File masks window the specified file mask and its type: Include or Exclude. Repeat steps 'b'–'e' for each mask that you want to specify. After you specify all file masks, switch to the OK button and press Enter. To remove a file name mask, in the File masks window, select the necessary mask and press Delete.